This newly renovated cottage is located in the heart of the township of Daliburgh, just three miles north west of the ferry terminal at Lochboisdale. 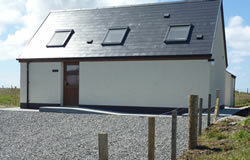 Only 50yds from the Borrodale Hotel and close to local shops and other amenities, this is an ideal base from which to explore the Uists and Barra. Please note: This property sleeps 2 adults + 2 teenage children in loft. The well appointed accommodation comprises a fully fitted kitchen with all modern appliances, a separate sitting and dining area with feature electric stove and LCD TV, one double bedroom and a shower room. There is parking adjacent to the property. A ten minute walk takes you to the nearest beach, and Askernish Golf Course, originally designed by Old Tom Morris in 1891, is just a 5 minute drive away.